Hi I’m a developer girl! I’m a miss-know-all. Still choosing between Yii2 or Laravel? But who told that girls cannot be bold? Wait for it, wait for it, I’m a girl from GIT, here is my surprise, let’s see: I know something about Marvel and DC. In my opinion comparing these two frameworks is like analyzing Marvel and DC universes. Each of them has its own fans and each has its pros and cons. 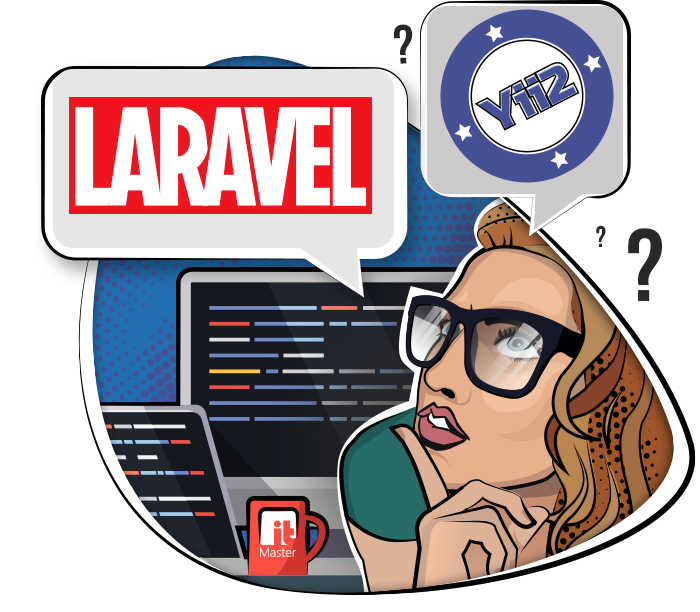 In terms of following the patterns and principles, as well as releasing updates Laravel is way ahead of Yii2, just as the Marvel universe in the CINEMA vs. DC, and there's really no point arguing about it! And if someone even dares to do it, they should remember that Yii2 still uses Bootstrap 3 and Service Locator (which is considered as an antipattern). Yii2 has lots of out of the box widgets and a tool for rapid development (code generator for models, controllers, CRUD). But Marvel universe has Quiksilver, and Laravel has artisan and built-in script collector. Blade template engine will cheer you up and save from difficulties related to lack of widgets. “Large scale” is a concept that describes DC (it has more TV shows for every taste and ambition), and as for Yii2, it implies easy start, clear documentation, much better support for IDE-systems, which means simplicity and easier support and maintenance of the project in the future, even if the development team changes. Finally, Laravel has all the tools for creating REST API, from Middleware and Resource Controllers to flexible routing. And what about Marvel in this case? :) I just love these comics and their heroes! And here is my purely subjective conclusion: if you need a fast-very-fast or faster-than-all solution for creating a web-system without any complex support, choose Yii2, but if you also need an application for mobile devices and or just want to keep pace with (the Avengers) modern technologies, you should definitely choose Laravel 5.x.